Our plans to cycle along the river were halted not even half way when out of nowhere I experienced some fairly sharp piercing pains to the right side of one of my knees. Arghhh! When it became clear I couldn’t continue cycling we boarded the train for Perth at Canning Bridge, and all the while feeling grateful the section of path we were on, was super close to the Mandurah train line. We didn’t want to end the morning in Perth so soon and instead made our way across the train tracks to Northbridge Brewery for a ‘boozy’ breakfast. Although feeling bummed, being able to indulge in breakfast was a good turn of events! We chained the bikes to a tree we found in front of the brewery (following breakfast we discovered bike racks a few metres away near San Churro). Northbridge Brewery serve breakfast over the weekend from 8:00am to 11:00am. Its counter service and this includes taking the drinks back to the table. A tip, before ordering, take note of the table number as you’ll need this at the counter. Northbridge has a relaxed neighbourhood vibe in the early morning and there’s a couple of other decent cafes open nearby. It was good to sit down, catch a few of the suns rays and sip on cold drinks. I went with a glass of Jansz Cuvee NV champagne and the other half, a pint of Northbridge Brewery’s very own Lager, which happened to win silver in last year’s Perth Royal Beer Show. Highly recommend trying this one. The breakfast pizza (we select GF base) arrived to the table shortly after placing our orders. It’s fair to say we’ve worked up an appetite from the cycle and tuck in without delay. 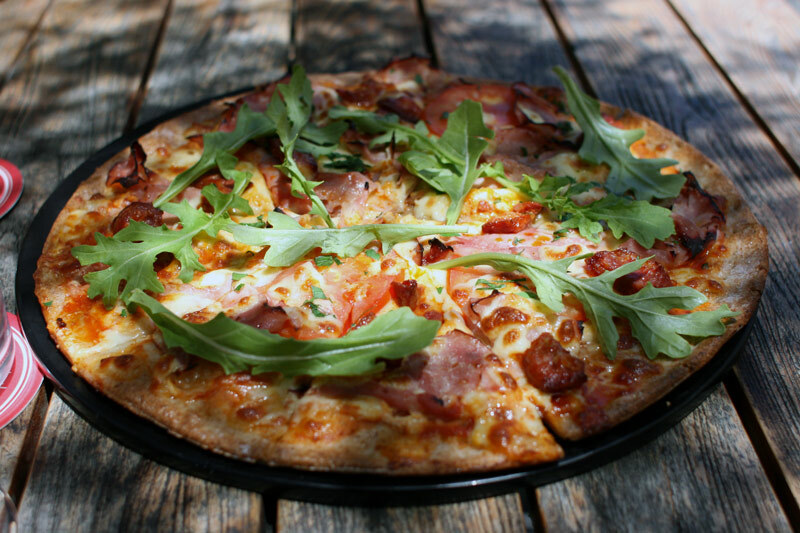 The pizza is topped with salty chorizo sausage, egg, strips of honey leg ham, tomato, and fresh greens of rocket. I have to admit, I’m not one to be trusted when sharing a pizza, because I’ll eat the whole thing, more so it’s an occasion where my stomach turns into a bottomless pit. The breakfast pizza is delicious and the ingredients are fresh. It’s not overly greasy aside from the stringy mozzarella, the very same cheese that makes a pizza I have to say. It’s great. The gluten free base is biscuit thin and it’s not overcooked like some GF bases I’ve had before.With each slice there’s a good taste of toppings. Pizza and alcohol in the morning, we are merry and ready for a nap, or laze by the beach. We certainly had enough energy for the return journey home. It was an enjoyable morning at Northbridge Brewery and I’d definitely return again. The brewery makes a great stop for cyclists, especially with the separate billing for tables. I didn’t try the coffee this time round but there’s always next time.